The Dissidia series is to Final Fantasy as Super Smash Bros. is to Nintendo. It's a Massive Multiplayer Crossover Mascot Fighting Game for the bone-breakingly popular Final Fantasy series, bringing together heroes and villains from across the first thirteen games to battle it out for the fate of the multiverse. The first game, Dissidia Final Fantasy, received a prequel, Dissidia 012 (read as "Dissidia Duodecim"), in March 2011, featuring the whole cast of the original plus some more characters, a remake of the first game with a world map, and gameplay changes. The story goes that the God of Discord, Chaos, and the Goddess of Harmony, Cosmos (a new character), are waging war by summoning champions from other worlds to a new world. The champions are tasked to fight until one of the two gods is victorious, at which point they will be freed to return home, but there's far more to the war than the mortals have been told, and the war isn't as divinely important as they're lead to believe. The game's story reveals that the war between the gods is part of a "Groundhog Day" Loop, with Laser-Guided Amnesia inflicted on the losers before they awaken to fight again after one side loses. Thus the heroes seek to carry out Cosmos's plan to bring about a true end to the cycles and stop the plans of Chaos's warriors to exploit the cycle for their own ends. Bonus storylines reveal the nature of the two gods, how the war came to start, and why. The game features hybrid-RPG elements, your characters gain levels and learn new abilities, and getting them items and equipment is a core element of gameplay. Specifically, the game uses variations on the Final Fantasy IX ability learning system, Vagrant Story's timed attacks, scattering power orbs in battle like in Kingdom Hearts, map movement that resembles the system from Final Fantasy Tactics, and Final Fantasy VII: Advent Children style physics. Warriors of Cosmos: Warrior of Light, Firion, Onion Knight, Cecil Harvey, Bartz Klauser, Terra Branford, Cloud Strife, Squall Leonhart, Zidane Tribal, Tidus, and Shantotto. Warriors of Chaos: Garland, The Emperor, Cloud Of Darkness, Golbez, Exdeath, Kefka Palazzo, Sephiroth, Ultimecia, Kuja, Jecht, and Gabranth. Newcomers in 012: Kain Highwind, Gilgamesh, Tifa Lockhart, Laguna Loire, Yuna, Prishe, Vaan, Lightning and lastly, Feral Chaos. All of them have their own character sheet except for the latter. Additional NPC Assist Characters and Other characters: Aerith Gainsborough (Assist Character only), Cosmos, Chaos. The campaign mode features storylines for the Cosmos-aligned characters that interact to form a much larger storyline, as well as a simple Arcade Mode, Quick Battle and a Duel Colosseum. Combat in Dissidia revolves around the "Bravery" system, which is an elaboration on the Break Meter idea. You have two kinds of attacks, Bravery and HP, and reducing your enemy's BRV to zero will (of course) Break him. What's unusual about BRV is that yours goes up as you damage your opponent's, and if you Break him you get an additional bonus. Plus, HP attacks do damage equal to your current BRV, with the caveat that once you land one your BRV drops to zero and has to go through a short recovery process. (Landing a second HP attack during this time will do no damage but will regenerate you to full BRV on the spot.) Long story short, if you build up enough Bravery and put your opponent in Break, a One-Hit Kill is very possible... and if you miss, an unexpected reversal is just as viable. Each character also has their own fighting style, which take different angles on the synergy between the two types of attacks: Squall has a powerful BRV game but slow HP attacks, while the Onion Knight has weak BRV attacks but can quickly chip away at your HP directly. Still other characters do completely different things with their Bravery games—Shantotto's specializes in Standard Status Effects BRV attacks to stun the opponent for her HP combos, while most of the Emperor's Bravery attacks aren't meant to actually hit the opponent so much as set them up to fall into his Death Trap-based HP attacks. There's also Summons that modify Bravery in different ways, or mess with the opponent's Summon. Not to mention the air vs. ground games, the different effects of the stages... the short version is, this is an intricate game. Finally, there is a Limit Break mechanic, as you'd expect from the franchise of the Trope Codifier. As you and the opponent land hits on each other, glowing blue/white orbs called EX Force appear in the air, and now and then an EX Core will appear on the stage and absorb all the stray EX Force floating around it. These fill the EX Gauge, and when it gets full you can go into a Super Mode called "EX Mode," where your character transforms and gains an increase to their damage output in the form of more critical hits, as well as numerous character-specific abilities like gliding in the air, landing more hits when you attack, special super-attacks, and so forth. And then when you land an HP attack in EX Mode, the real Limit Break begins, called an "EX Burst." Usually based on the character's strongest attack in their original game, EX Bursts are flashy cinematic attacks where you use Action Commands to power up your attack (tap a button to fill a power meter, execute a sequence of button commands, etc), landing more hits of Bravery damage as you build up to a powerful HP attack. EX Bursts more often than not turn out to be Finishing Moves due to the huge amounts of damage they deal. In addition to Experience Points and gil, you also get Tech Points for adding mastering the abilities in your character's Point Build System, and "Player Points" used for buying yourself new bonuses, gameplay options, characters and etc. Finally, the game has RPG Elements, meaning that almost any boss is surmountable with sufficient Level Grinding. Aside from the gameplay and story, the game features countless allusions to the franchise. There are dozens of Continuity Nods and Mythology Gags, the developers have clearly Shown Their Work to properly represent the cast and their games of origin, there's quite a bit of Lampshade Hanging and Meme Acknowledgment, and the storyline is also chock full of allusions to previous games, from story parallels to line dropping. In short, the game doubles as a love letter to twenty years of Final Fantasy and the fandom that made it so famous. Being that it is a fighting game, players also get to have fun beating up their most hated characters with their most beloved, and can play out match-ups fans have argued for years. You want to see Kefka and Sephiroth duke it out, or Cloud and Squall have a duel? It's all yours. The future of the series was somewhat confused for a number of years; Tetsuya Nomura himself said that Dissidia 012 would be the last entry in the series, at least "in its current form"; that is, a Fighting Game. Instead, Theatrhythm Final Fantasy was created, marking the series' Genre Shift to a Rhythm Game. However, other influential team members, including producer Ichiro Hazama and series director Mitsunori Takahashi, went on record as saying that they'd like to do a third fighting game-style Dissidia title, due to the series' popularity (and resulting profitability) with new fans. This eventually manifested itself in a third installment announced in February 2015, simply titled Dissidia Final Fantasy. Meeting long-time fan requests, the 2015 iteration of Dissidia is designed for arcade use, with a PlayStation 4 port, Dissidia: Final Fantasy NT, set to be released in 2018. This new version is a reboot of the franchise, and introduces two new gods who are expies of Cosmos and Chaos. 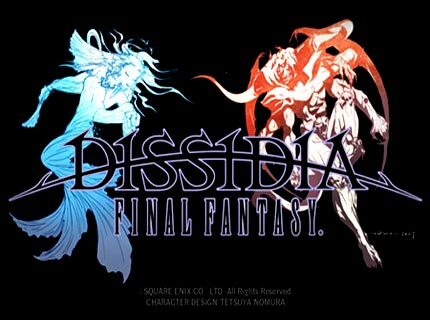 Dissidia has no relation to the other Final Fantasy fighting game. Has character sheets, as well as pages for Mythology Gags and Foe Yay.